The ultimate travelers map, scratch off the destinations you have visited and reveal the beautifully styled, up to date world map poster underneath. This extra large world map makes a brilliant and unique gift for the travel enthusiast, allowing complete personalization of the world travel map to display a unique adventure. This concept map of the world is printed onto high quality silk art paper with a gloss coating, and the scratch off travel map works exactly like a scratch card - once the gold coating is removed it reveals the huge world map underneath. To scratch off the world map simply grab a coin and remove the coating over the destinations you have been lucky enough to visit. Not only are countries featured on the scratch off map, there are also cities shown on the top layer and the colorful, political world map underneath, allowing for more detailed scratching. The large wall world map measures 33 x 23 inches, and the frame is not supplied. Your world scratch off map is supplied in secure, protective packaging, rolled in a tube for crease free delivery and immediate display. Maps International create beautiful and geographically precise maps that inspire and encourage learning about the world that we live in. We are the definitive online map shop where you can find the finest range of quality wall maps, including our most popular world maps. Our parent company Lovell Johns, has charted a legacy of over 50 years of cartographic excellence, so mapping is at the heart of everything we do. We deliver across the world, with offices in the US and the UK, where our expert team of cartographers work with passion, on a stunning range of maps for all moods and homes. CARTOGRAPHIC DETAIL WORLD MAP WITH STATES: Scratch off travel map world destinations to reveal the colorful political map underneath. The best mapping detail you will find for this scratch map world poster. Featuring countries, cities, hill shading and state outlines on both scratch coating and mapping underneath. 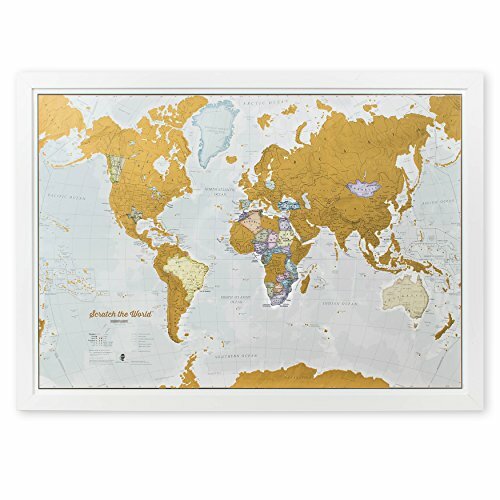 EXTRA LARGE WALL MAP: Poster measures 33 (w) x 23 (h) inches - the huge world map has outlines on the gold coating and details on the map underneath. WORLD SCRATCH OFF MAP TRAVELER GIFT: This scratch off map of the world is a great gift for your favorite adventurer to plan a trip on the world map wall poster then record their journey! Also the perfect gift to educate young explorers. CREASE-FREE DELIVERY: Your travel scratch off world map is rolled in a tube for delivery, so it arrives ready to display. MAPS INTERNATIONAL: Our philosophy of 'cartographic excellence' combines detail, design and high quality finishes in a range of stunning wall maps.